Toucan Bright Blue | Inkdependence! This is the best blue of the group, and one of my favorites, overall. Bright Blue is just that: a bright blue. It's on the light side of the blue spectrum, but not a turquoise. The flow on this ink is great, even after quite a while in the pen. This ink has been in this pen for a long time, and I sometimes don't use it for several days at a time, but it didn't give me any hard starts that I can think of. Smooth sailing, really. This isn't the most formal sort of blue, but it's a very readable sort of blue for notes or missives or whatever. There's some shading in this ink even from the fairly fine nib of this Lancelot. I imagine it would do even more of that in a broad nib. I've used up the vast majority of this ink, though, so I can't really test that. No problems here. Good behavior on all counts. This ink is bright, but it's not like a turquoise (as you can see below). It's not really formal enough for most people's work, but it's a great ink for general writing. I took this video with our new camera, and the video came out really well (full HD), but it took an age to upload to YouTube. I don't know if I'll do that again. Anyway, check it out in HD. 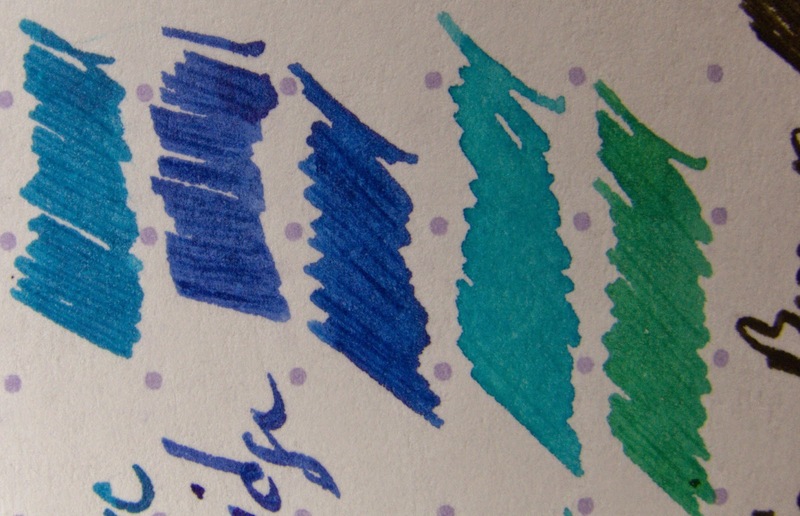 Toucan's Bright Blue is a really good blue ink. It's well behaved, and it's going to work well for folks who don't need a super-formal blue. You can (only) find bags and samples over at Anderson Pens. A 60ml bag goes for $10. They're out of the full size at press time, but check out a sample, at least.